Anyone who is a White Sox fan, raise their hands! Here we have a great addition to any MLB memorabilia collection. This Chicago White Sox baseball has been autographed by 26 members of the 1959 team. Being only the second team to win the A.L. pennant between 1949 – 1964, and though the White Sox lost to the National League Champions, the Los Angeles Dodgers, they remained a heavy hitter team. Standing the test of time and adding to their glorious history, this rare signed baseball is a must have. 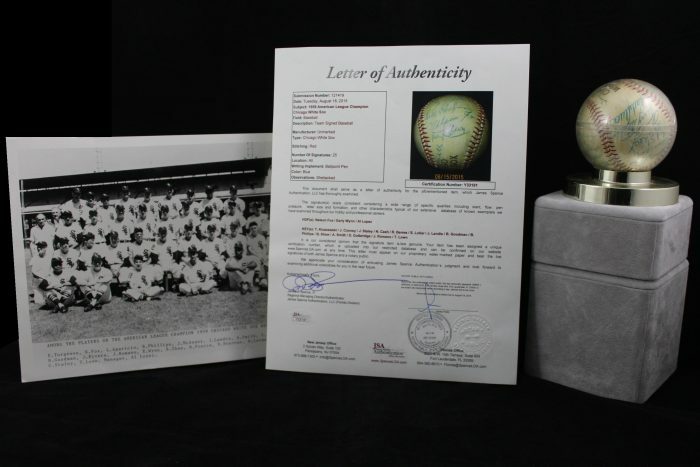 The baseball comes with the Original Certificate of Authenticity as well as a portrait of the team at the time. The baseball’s plastic display case is cracked and there are minimal scratches, as it was previously owned. The ball is in good condition.